Fall is by far my favorite time of year for one reason: Halloween! I live life for this holiday. I look forward to October 31 all year, and aside from my brother's birthday being on November 1, I think that is the worst day of the year (my husband claims it's his favorite day of the year but I can't imagine why? :) My obsession with Halloween goes back to childhood memories. My family always welcomed fall with such open arms, and my dad made a huge deal out of Halloween. We would go to the extremes with decorations - making scarecrows and monsters out of old flannel shirts, hay, and scary masks. Pumpkins and hay bells would always be at the end of our driveway, complete with monsters hanging in trees and scarecrows sitting in chairs. My dad and my Nenne were both big on dressing up, and they always had such memorable costumes! My dad loved to buy a new scary mask every year and play tricks on people with it. Looking back, I feel like we celebrated Halloween the entire month of October. I can remember being just a little girl, and telling my mom, "There's something extra special about fall.. It's the only season I can smell." That stands true today. I can smell fall when it's coming, and starting October 1, our house smells of pumpkin, chili is often on the stove, our television plays only movies in the scary genre, and I insist on buying at least 20 gigantic pumpkins and squash to decorate with. I get chills just thinking about it. This soup is special to me because we do a Halloween dinner party every year, and this was the first fall soup I ever created for it. It was a huge hit, so I make a batch (or three) every fall. Toss squash, potato, and carrot with 2 tbsp of olive oil, salt, and pepper on a baking sheet. Roast veggies for 35 minutes or until soft. While veggies are roasting, heat 1 tbsp of olive oil in a Dutch oven or large pot over medium heat. Sautée onion and celery with a dash of salt until translucent. 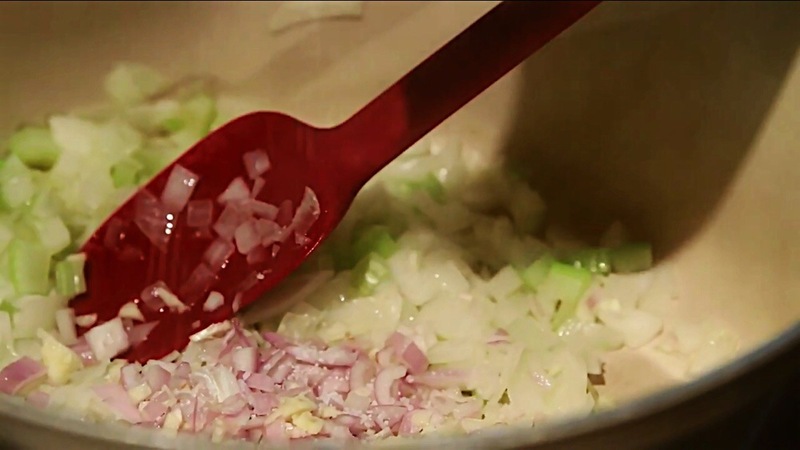 Add garlic and shallot to the pot with a dash of salt and cook for one minute. Add the vinegar or liquor, stock, maple syrup, spices, and roasted veggies to the pot. Stir to combine. Using a hand blender (or transfer soup to an electric blender working in batches) blend soup together until smooth. Let the soup sit over low heat for 30 minutes or longer (the longer it sits the better it tastes). Make the relish. 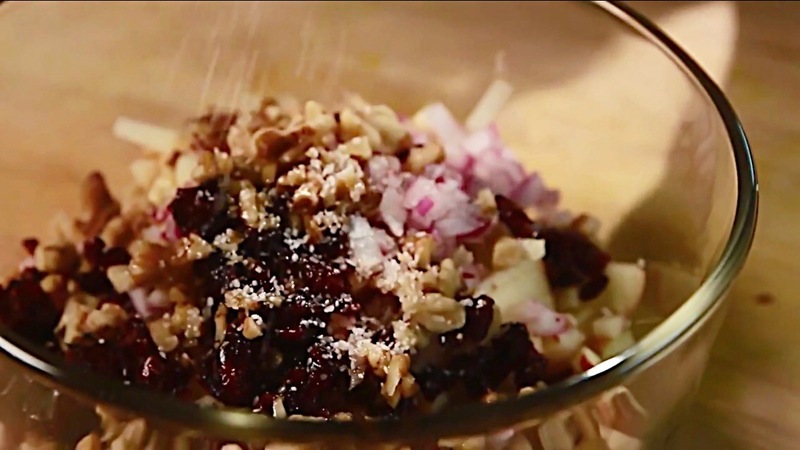 In a bowl, stir together the apple, walnuts, red onion, cranberries, maple syrup, apple juice, and about 1/8 tsp salt. 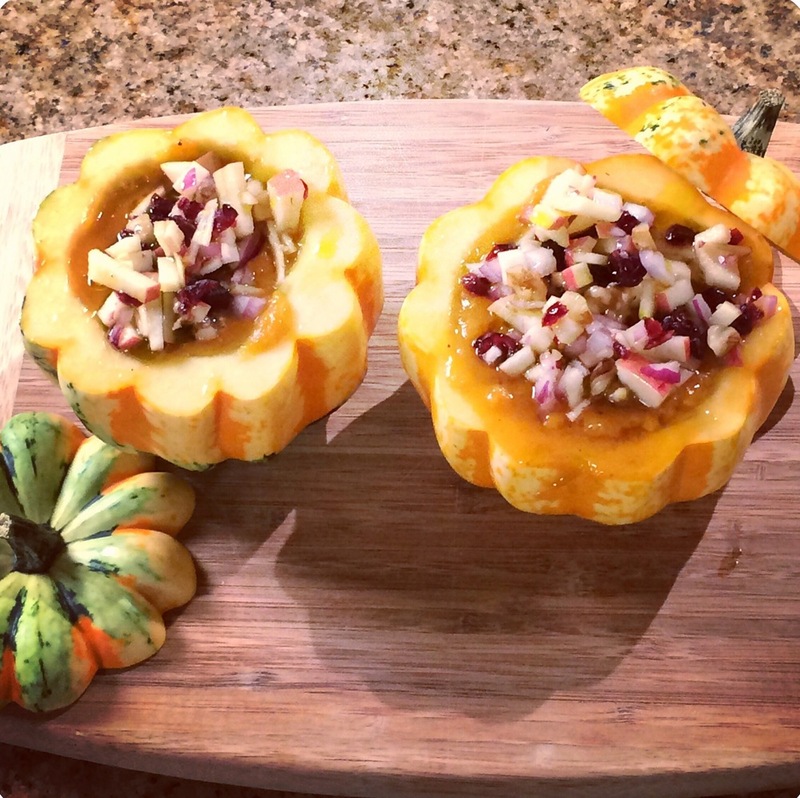 Make the squash bowls by cutting off the corner of the bottom (this makes a flat surface for it to sit on). Then, cut off about 1 inch of the top. 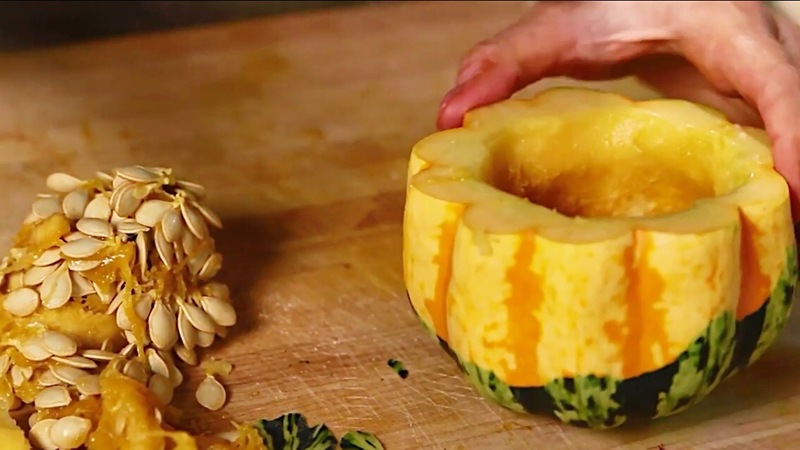 Using a spoon, scoop out the seeds and insides until smooth and in the shape of a bowl. Taste soup before serving and add more salt if needed. 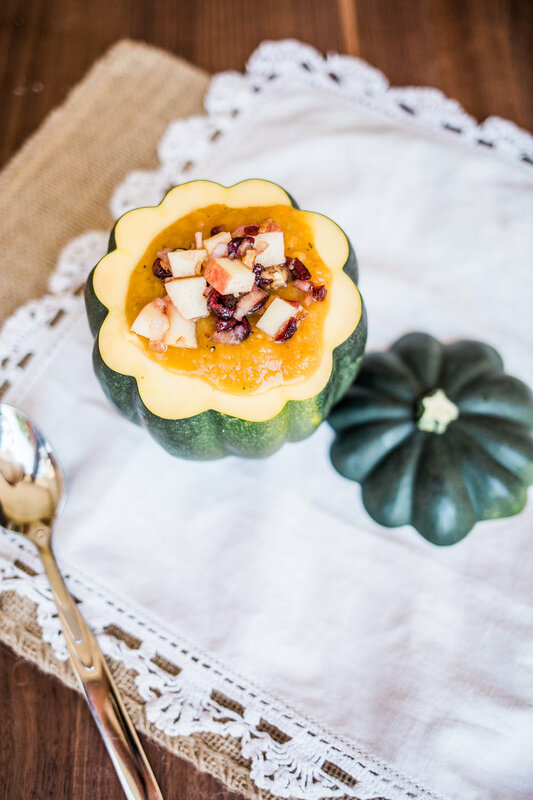 Ladle soup into the squash bowls and top with apple relish.